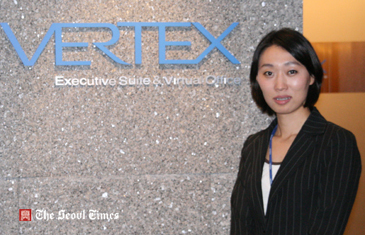 Vertex Korea PR Director Lee Seol-Young stands at its Entrance. 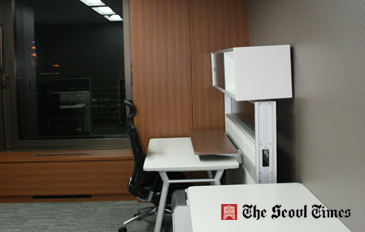 An executive suite and virtual office in the downtown area of Seoul awaits both local and international business. Its catchphrase is, "Your business partner, premium business center Vertex Korea." With state-of-the-art equipment Vertex Korea could best meet the needs of businessmen and women from the local region or from overseas when they want to use the office space for a short period. 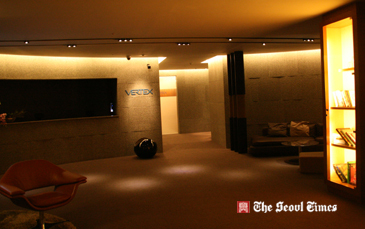 "Vertex Korea established benchmark business centers in developed countries, including U.S., England and Japan, by organizing opening project team since January, 2007," President Park Suk-Hun of Vertex Korea said recently. "Before, we opened Vertex Korea in 2008"
He said many business centers were opened after the Asian financial crisis, locally referred to as the IMF crisis. "But they lacked quality service, security, and interior design ability," President Park said. "Then I started Vertex Korea, which is optimistic as a business model," he said. 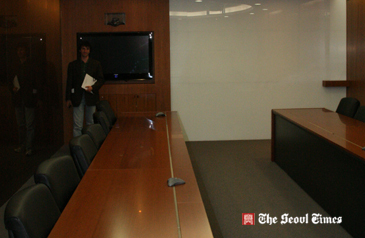 "Also, it offers public meeting rooms for companies devoid of conference or seminar rooms." Located on Gwanghwamun crossroads, the epicenter of Seoul and the hub of numerous globally operating companies and foreign embassies, Vertex Korea provides optimum embience to the businessfolks. Major government offices and Seoul City Administration building stand among the nation's major newspaper company buildings and top five-star hotels. Vertex is housed on the 21st and 22nd floors of the 27-story building "S-Tower," which was built by high-tech construction methods of Japan. Each floor has the space of 452 pyongs (one pyong equals 3.3 square meters). President Park is also CEO of S-Tower. The structural safety makes the building able to withstand an earthquake of magnitude 7. The S-Tower adopts VAV (variable air volume) systems on each floor so fresh air constantly circulates thourghout the building. The highest value of Vertex Korea is placed on customers' safisfaction. Other factors such as security, sanitation, fire fighting, and parking are also superb in the spacious Vertex Korea. Asked about the advantages of Vertex Korea, President Park said that above all, Vertex Korea is located on the top floor of the high-rising "S-Tower and the tower was built with top-of-the-line construction methods, including earthquake-resistance and natural air filtration. "We defend customer companies with 24-hour security inside and outside of S-Tower," President Park said. In addition, residents and visitors have such convenience as using a wide parking lot and highly comfortable "Relax Room" equipped with massage chairs and music for meditation. "However, most important of all is Vertex Korea's spirt of kindness and service-oriented attitude," President Park said. "Vertex Korea staff never say 'No' to any customers. 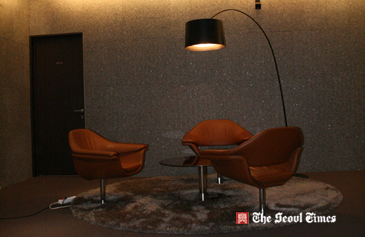 You can expect the highest level of service here in our place"
Vertex Korea could be the ideal place to work, particularly for project teams, business travelers or any individuals who want to use its office spaces for a short term. Regarding the conference room, customers are given the choice to select which type of meeting room suits their needs, including internal or external meetings, interviews, employee trainings and product demonstrations. Vertex Korea's "Virtual Office Package" enables customers to establish a contact point in Seoul while their headquarters are elsewhere, including overseas. Customers can use Vertex Korea's address as their own official address. Highly-trained and bilingual secretaries could be another advantage. They are available around the clock as if they are your personal secretary. Checking messages and mail would be a piece of cake. Other services Vertex Korea offers include publicity, marketing, tax affairs, legal work, virtually everything they need. The rationale is to allow each customer to focus solely on their own business.